This is yet another of the myriad of bootlegs to come out of Poland and Eastern Europe. Until recently not too much was known about it. 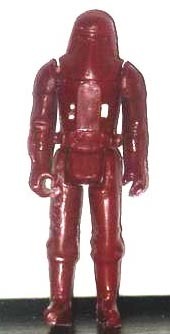 The figure is made of a hard, hollow plastic and is most reminiscent of the Hungarian Darth Vader from the much harder to find pig-nosed Yoda series. It has it's own limbs and is fully articulated, aside from that not much else was known. Recently though, a European contact informed me that this figure was released on a card not like any of the standard 1st Generation articulated bootlegs that have been seen before. 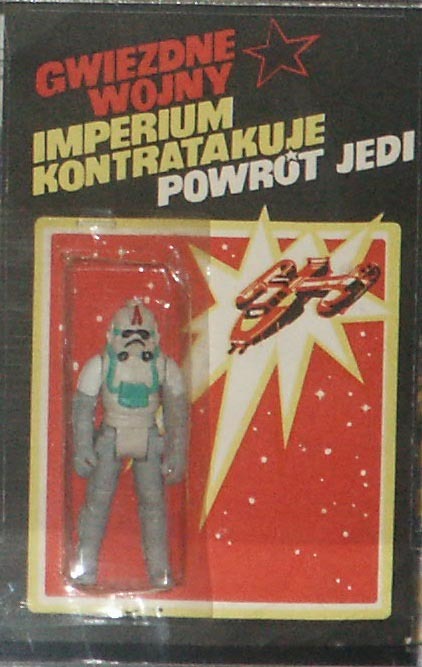 He informed me that this series of bootleg came on a card bearing graphics similar to a licensed Hoth Stormtrooper but with Polish text. My contact also told me that the figure came in 3 colors, red, black, and yellow. Here is an example of the black figure from this series. The owner of this informed me that they had one during thier childhood and recalled it coming with a skirt and weapon similar to that of it's licensed counterpart. The presence of hooks at the belt area adds weight to this. The final picture is the only evidence to date of the card that these figures came on. I've done my best to enlarge and enhance the image but sometimes we must make do with poor quality images if that is all we have to work with. If anybody can add more information or supply images of a card or yellow figure please do not hesitate to contact me. Description by: John J. Alvarez, Kate D., Tomasz K.
Photo: Joseph Yglesias, Kate D.
From the collection of: Joseph Yglesias, Kate D.